Amazon announced back in June that its Android Appstore would be coming to Europe this summer, and today it’s finally here — nearly 18 months after making its debut in the United States. The Google Play alternative will initially be available in the United Kingdom, Germany, France, Italy and Spain. In addition to localized content specific to each country, European customers can enjoy all the features that have made Amazon’s Appstore so popular, including “Free App of the Day,” which, as its name suggests, offers up a paid app for free every 24 hours. For its launch today, the Appstore’s free app will be none other than Angry Birds. As if you don’t already have it. Other Appstore perks include periods of exclusivity for certain titles — before they hit Google Play, personalized recommendations, customer reviews, and 1-Click payments. And unlike the Google Play store, you can be sure everything you download from the Appstore is tested and backed by Amazon, which means no more money wasted on apps that don’t do as they claim. “Customers in the U.S. have purchased millions of apps, games, in-app items and subscriptions since the store launched last year, and we’ve received great feedback about discovery features like Free App of the Day. We evaluate and test games and apps before making them available in the Appstore so we ensure customers have a great experience with the games and apps they purchase,” said Jim Adkins, Vice President of Amazon Appstore. You can get the Appstore on your Android smartphone or tablet now by visiting www.amazon.com/getappstore, and downloading the apk. Amazon’s full press release is below. SEATTLE & LUXEMBOURG–(BUSINESS WIRE)–Aug. 30, 2012– (NASDAQ: AMZN) – Amazon.com, Inc. today announced the launch of its Amazon Appstore in the U.K., Germany, France, Italy and Spain, giving European customers access to Amazon’s broad selection of quality Android apps with the convenience of shopping on Amazonfrom their Android phones and tablets. 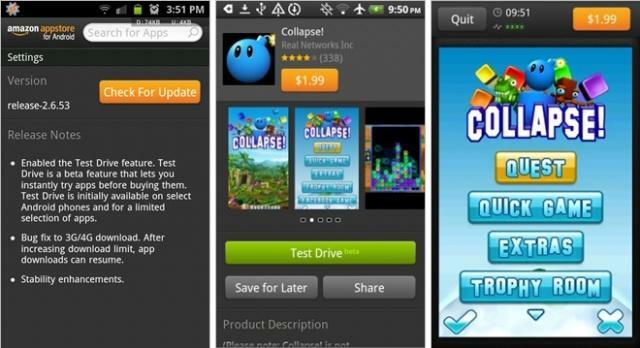 Customers can get the Amazon Appstore for their Android phones and tablets by visiting www.amazon.com/getappstore. Amazon and its affiliates operate websites, including www.amazon.com, www.amazon.co.uk, www.amazon.de,www.amazon.co.jp, www.amazon.fr, www.amazon.ca, www.amazon.cn, www.amazon.it, and www.amazon.es. As used herein, “Amazon.com,” “we,” “our” and similar terms include Amazon.com, Inc., and its subsidiaries, unless the context indicates otherwise.